Layoffs At Last.FM Confirmed. Where Else Are Heads Rolling At CBS? Today, CBS Interactive is laying off people across several of its properties, I’ve confirmed with the company. CBS is not saying which divisions or how many people are affected. It is positioning the layoffs as part of the integration process it began six months ago when it bought CNET for $1.8 billion. But it is not just the CNET businesses that are being cut. I’ve also confirmed that earlier today employees at social music site Last.FM were let go. 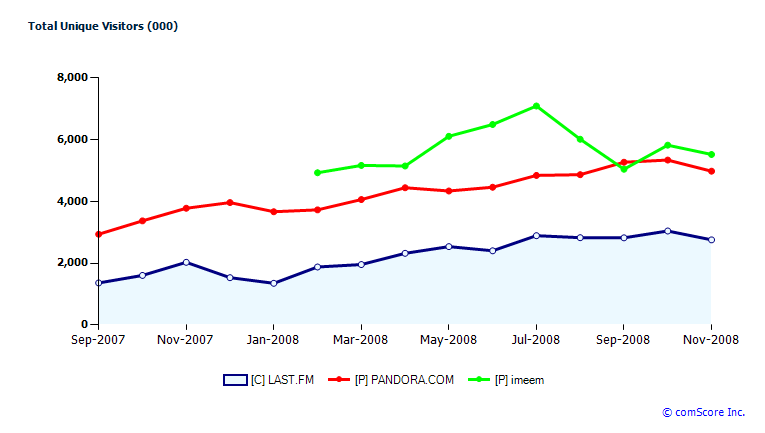 CBS bought Last.fm in 2007 for $280 million. One source puts the number of layoffs at as many as 40 people, mostly from LAst.FM’s London HQ, which has a total staff of 95. A spokesperson for CBS Interactive says that number is inaccurate on the high side, but won’t provide the correct number. In any case, it is likely a small fraction of the overall number of employees being laid off across CBS Interactive. Update: CBS says the number of Last.fm layoffs is less than 20, which would put it at about 20 percent. Last.fm never really became a big money maker from what I can gather, and all of those engineers and other staff members are not cheap. Even after a redesign last July, growth has been flat. According to comScore, Last.fm had 9.2 million global unique visitors in October, a 6 percent increase from July. Imeem is still much more popular, with 22.1 million global visitors. And in the U.S., even Pandora has a bigger audience (4.97 million uniques in November, versus 2.75 million, see chart below). If you know which other CBS Interactive divisions are going through layoffs today or the total number of layoffs, leave us a tip and we will add it to our Layoff Tracker. Update 2: There were also layoffs at CBS Sports where, a tipster who is a former employee tells us, “the entire accounting department” was lost, as well as jobs in Database Applications and Data Warehouse . The Last.fm staff learned about the layoffs a little more than an hour ago. Below is a screenshot from one of their friends, showing their reaction on Facebook. That first status message is in Swedish and says, “better start planning for the future.” Update 3: Matt Hillman says that his status message below was not related to the layoffs.